Millet is often known to be the most important ingredient in bird seed. However, it is much more than just for birds. 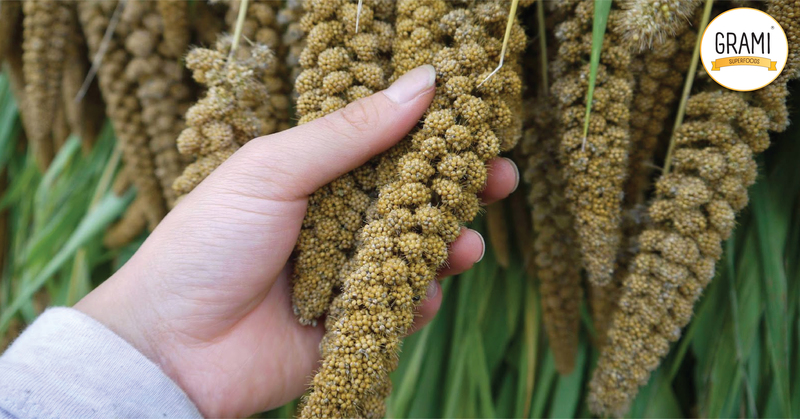 Just like mashed potato and fluffy rice, millet is also a delicious grain which can accompany different types of food. The hulled variety of millets is generally found in the stores as well as the local marketplace. The good source of Magnesium in millets is the reason why it should be included in the list of heart-protective foods. Besides being heart protective, Magnesium has shown to reduce the severity and frequency of both a migraine and asthma attacks. It also helps to lower high blood pressure and reduces the tendencies of heart attack, especially in the ones who are suffering from a diabetic heart disease. The phosphorus contained in the millets play an important role in every cell structure of the human body. It also helps to form the mineral matrix of bones. Phosphorus is also known to be an essential component of adenosine triphosphate which is a life-critical compound (a molecule known to be the energy currency of the human body). It is also an important component of the building blocks of genetic code, i.e. nucleic acids. The structures like cell membrane and nervous system are lipid-containing; whose essential component is phosphorus. The bodily enzymes like glucose and insulin contain Magnesium and millets are known to be the rich source of Magnesium. The ones who frequently had the grain did not get affected by diabetes. The whole grains are also known to offer special benefits as they promote and control healthy blood sugar. Millets are rich in insoluble fiber and can help the women in avoiding gallstones. The insoluble fiber speeds up the time for intestinal transit. It also reduces the secretion of bile and triglycerides and increases insulin. Whole grains like millet which is rich in fiber helps to protect the individuals from breast cancer and mostly for the pre-menopausal group of women. According to researchers, an increased consumption of whole grains like millets decreases the risk of childhood asthma. Whole grains like millets have both free and bound phenolics which is responsible for the high amount of antioxidants in the whole grains. Researchers have found that populations consuming high fiber-rich diets, especially whole grains like millets have a lower risk of colon cancer. This is not just due to the fiber contained in millets but also the interaction of all the other nutrients contained in the whole grain along with the phytonutrient. Precisely, their wholeness lies in the key to their powerful potential of fighting cancer. Plant lignans are the major types of phytonutrients which are abundantly found in the whole grains, especially millets. After being consumed, they get transformed to mammalian lignans as they get converted by the friendly flora present in our intestines. This also includes enterolactone which prevents breast cancers and other cancers that are caused due to hormones along with the heart diseases. Post-menopausal women having high cholesterol, blood pressure with other symptoms of cardiovascular diseases should have whole grains like millets at least 6 times every week. The ones, who took millets as advised before, experienced a slower progression of atherosclerosis and lesser progression in the stenosis. Many studies have proved that consumption of whole grains like millets structures a protection against ischemic stroke, atherosclerosis, insulin resistance, diabetes, premature death, and obesity. Whole grains are known to be concentrated sources of fiber. But fiber alone does not serve. Rather, there are a number of beneficial components in whole grains like the wheat bran, wheat kernel, rich minerals, antioxidants, lignans along with the other phytonutrients. All of these together work to create a protective shield against the cardiovascular diseases. Whole grains have compounds like plant sterols, stanols, saponins, oligosaccharides and poly-unsaturated fatty acids that lower the effects of having cholesterol. Water-soluble and fat-soluble dietary sources along with the insoluble antioxidants are also found in the whole grains. The list of cereal antioxidants which come under it are tocotrienols, vitamin E, selenium, phytic acid and phenolic acid. Whole grains are known to be a rich source of lignans which get converted to enterolactone by the human gut. The insulin sensitivity is improved by the whole grains as the glycemic index of a diet gets lowered and also increases the fiber content, Vitamin E, and Magnesium. Hence, from the above information, it can be figured out that people of all ages can consume millets in the proper and advised proportion, i.e. 6 times a day. It is not only beneficial for the teenagers as it is rich in nutritive value and is also known to be a rich source of fiber. It is also beneficial for the ones who are suffering from diabetics and other diseases that are related to the heart. Besides, millets are also known to account for weight loss. The essential amino- acids in millets are lower than most of the other grains. The high fiber content in millets slows down the process of digestion which results in the release of sugar at a more even pace in the bloodstream. Methionine is also present in very high quantities, which is a sort of amino acid that cannot be found in most of the common grains. This gives millet a valuable and unique place in the vegetarian diet. A high-fat diet which contains 20% of millet protein can significantly decrease the levels of glucose and triglyceride and also increases the adiponectin level (a substance that is secreted by the fat cells and is responsible for regulating the appetite). Millet is also known to increase the high-density levels of lipoprotein and HDL – a better version of the cholesterol. With the substantial minerals and fiber, millet should be included in the list of a daily diet.